I can’t tell you how many times I’ve looked over at my kitchen counter to discover what I thought would be fresh bananas are now speckled enough for this easy coconut banana popsicles recipe. While I don’t try to overbuy on bananas, there always seems to be at least one or two brown bananas laying around or in my freezer! Whip up this super easy banana Popsicle recipe, and your kids will be asking for more creamy pops! 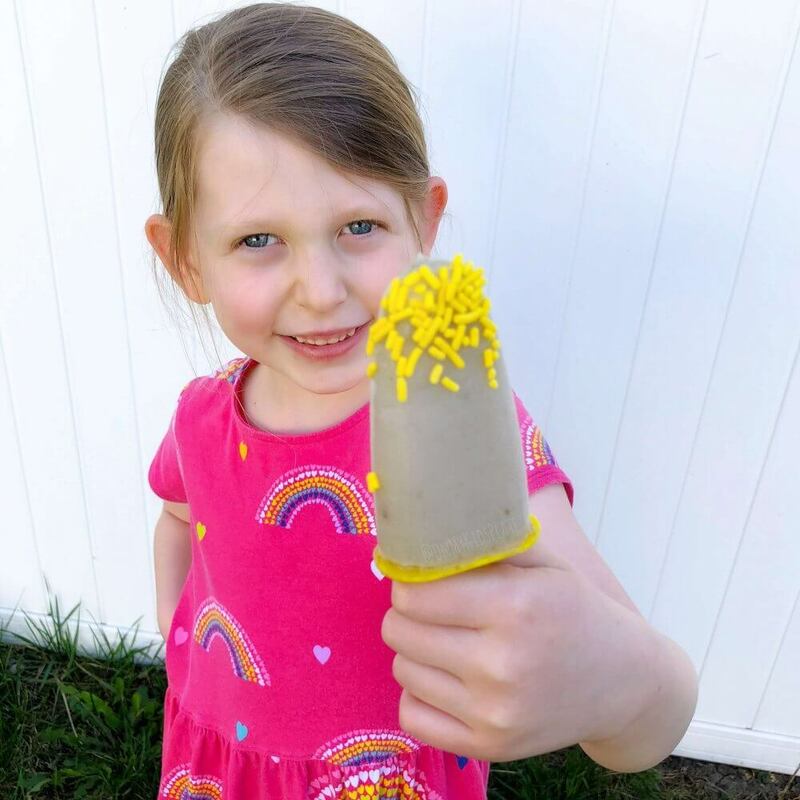 I’m not sure what makes a Popsicle quite so magical for kids, but they almost always seem to work like a charm for giving kids a little snack that you can feel good about. I know my kid would eat ice cream every day if I let her. We still eat ice cream but we mix it up a little with these homemade popsicles. This banana popsicle recipe is one I dreamed up while staring at a few extra bananas on the counter one day. We had made the classic berry popsicles, but this summer I’m determined to keep mixing up the flavors to keep things interesting. 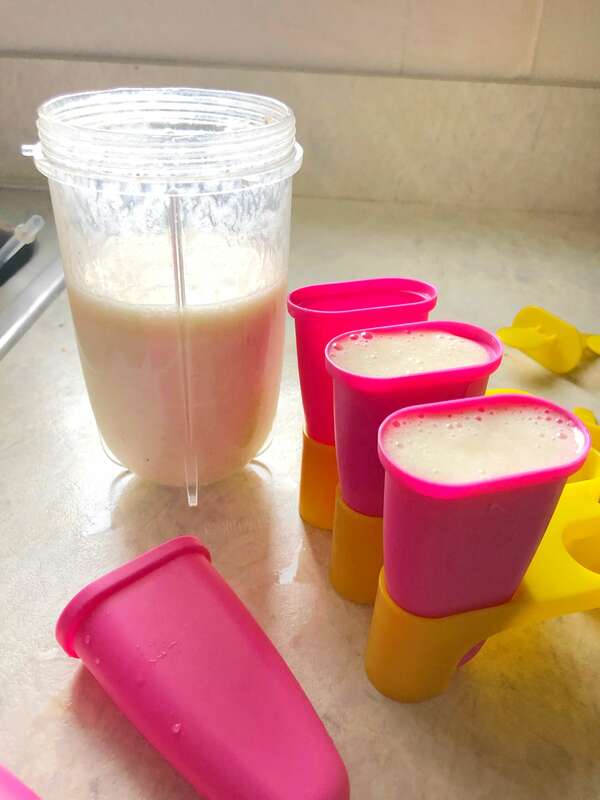 I have to admit, I started this recipe with only two ingredients, bananas and popsicles… I mean almond milk, ha! Start laying out your molds, and then grab your blender to start whirling things up. I used a simple mix of bananas and almond milk. You could use regular dairy milk, coconut milk or whatever liquid you have. We like to sometimes substitute almond milk when we have it on hand… or you know forgot to grab a gallon of milk at the store, not that I’ve ever been guilty of that! You can easily buy shelf stable almond milk, which I keep in my pantry. The color of this banana Popsicle recipe going into the pop molds was a pretty light white color that looked creamy. I noticed when I warmed up the molds by running them under a little warm water, when the popsicles slid out they were a bit darker than I expected. So I jazzed them up! To add sprinkles, all you have to do is dip your pop quickly in some cool water (not warm or it will melt your Popsicle!). Then generously sprinkle on some sprinkles onto your pop, and viola they stick! Serve these babies immediately, or you could refreeze on a cookie sheet if you want the sprinkles to stick a little better for a crowd. I just serve immediately. The kid’s eyes lit up with a smile when she saw the Popsicle, I barely snapped a few photos. In fact, I kind of had to bribe her a bit with the Popsicle to get a good photo. Sorry not sorry kid, ha! Have a bunch of extra overripe bananas hanging around that you’re using up? Sometimes we have a few too many extra laying around. We tend to be a bit all or nothing with fresh bananas. My friend Andrea over at Just Is a Four Letter Word has a great roundup of 18 Recipes To Use Over Ripe Bananas that might give you a few more great ideas! .5 cup almond milk milk, coconut milk or any other dairy alternative can easily be used in these pops! 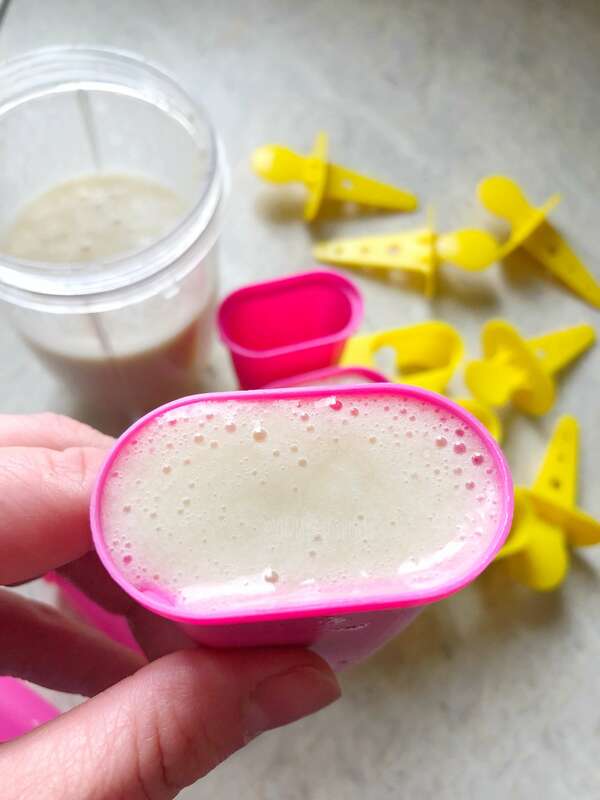 In a blender, mix peeled bananas and dairy or nondairy milk. Whip until there are no more chunks, and is spoonable. If your mixture is so thick it won't pour, add extra dairy or non-dairy a few tablespoons at a time. Pour popsicles into molds. Freeze minimum five hours, preferably overnight. Once frozen, remove from the mold as you are ready to eat! 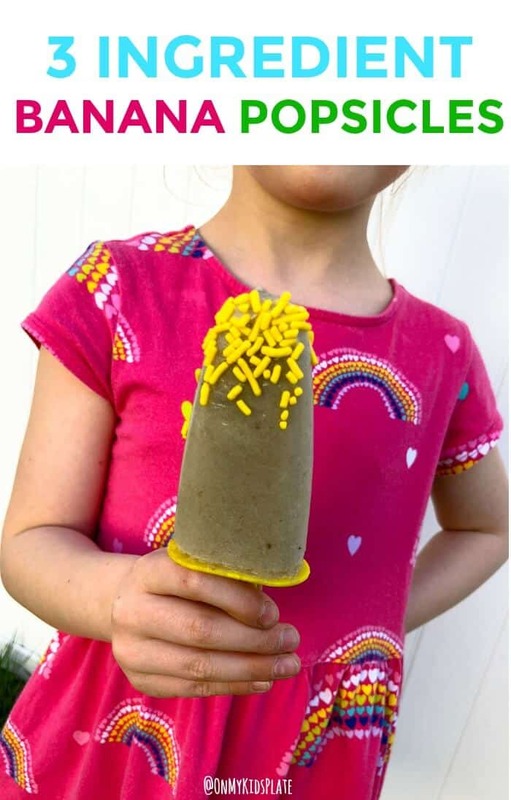 To add fun decorative sprinkles, remove banana popsicle from the mold. Dip popsicle quickly in cool water, then sprinkle on sprinkles. Serve immediately, or refreeze again on a cookie sheet for sprinkles to firmly set.